There is no doubt that safety in the workplace, legal compliance, and friendly working environments are key elements that employers must continually work to improve. 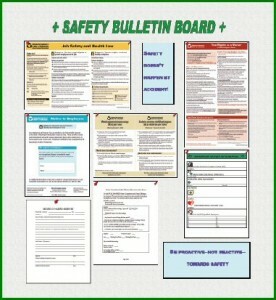 An attractive, well-organized safety bulletin board can help promote safety in the workplace. Does this look like your safety board? This is not what a safety board should look like. Reminding employees to put safety first is more effective than you may realize. Most districts have good intentions in maintaining their safety bulletin boards, posting new information and dutifully displaying labor and employment law posters. Unfortunately, the bulletin board often is relegated to the back burner and good intentions turn to neglect. 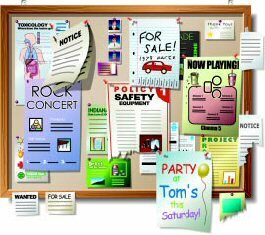 Posters become outdated, employee policies turn yellow with age, information is passed on verbally instead of in writing, and employees begin using the board as a place to post for sale items and party notices! It is no wonder that employees do not look to bulletin boards for the latest information. This is how your safety board should look. Employers must install and maintain a safety bulletin board in every fixed workplace (establishment) that has 11 or more employees. Beyond compliance, it is relatively easy to change an outdated, ineffective safety bulletin board into one that improves job safety awareness, instills employee respect, and builds a better relationship between management and the work force.